Welcome to the Lessons From Behind the Glass video series. Allison Tufts, author of the book by the same title, partnered with Hockey Eastern Ontario to create this video seris in which she sits down with coaches, players, parents and referees to talk about the many aspects of minor hockey. As the hockey season gets underway and you’re feeling the jitters of a new team, a new coach and a new list of hopes for your young player, take a moment to remind yourself that this is your child’s experience and you’re lucky to be along for the ride. One of best examples of when I forced my passion in my book was the story of when my son stepped on to the ice for his first hockey game. I had loved hockey so much that I assumed he’d love it too. I really felt that my passion for the game would be enough for both of us. I learned quickly I was wrong. Here is an excerpt from the book from Lesson #1 about our son’s first hockey experience. Once we surrendered to the fact that his passion was going to be something he’d have to figure out, the stress was no longer an issue. As soon as he found his own love for the game the rest was easy and I think that’s true of any child in whatever passion they choose. I never knew where to draw the line from being a supportive protective parent to being a parent that got in the way of his experiences. The problem was that I confused passion for knowledge. I realized that just because I loved him unconditionally and felt I knew him better than anyone else, that did not make me an expert in everything he was involved with. I needed to be the parent, not the coach, not the teammate, and most importantly not the nut case on the car ride home that went over every play in the game. The good news for all of you is that you are at the beginning, the beginning of a new season and the beginning of many new memories with your kids. As I said earlier, this is your child’s experience and you are blessed to be along for the ride. The best part is that the ride is amazing. You’re able to embark on a year of long talks in the car, exciting moments when they score their first goal or make that great save. This is the beginning of you learning to share in your child’s experiences, not take over them, not manipulate the outcome, simply share in them and enjoy every moment of their passion. Ry, our young hockey player in the video said it best when he said, “Don’t push them too hard, don’t ruin the game, tell them fun is the number one priority.” Basically, don’t force your passion, your child will find their own. As we move into October and the regular season is underway, I’m sure there is a lot of excitement and a lot of anxiety. Unfortunately, sometimes new excitement brings new things to be anxious about such as power play time, who’s on the penalty kill, and which goalie is the starter. This is when we as parents can have difficulty remembering that we are there to support and be spectators, not to control where our kids play or how much ice time they get. As you head into the rink please bring this lesson with you. I think it’s one of the most important lessons to remember as a parent and one of the toughest ones to act on. We opened last week’s video with a story from Brock when he was playing Junior Hockey. The story he told was of a Hockey Mom who called the coach complaining about her son’s ice time. This was something she had always done throughout her son’s minor hockey career. The problem was that she never taught him to have those conversations himself. Once he started playing junior hockey and the coach realized that this player had never developed these skills he made the decision to cut him. We need to remember that our kids won’t be this young forever, they are going to grow up and will need to advocate for themselves. There is no better sport to help them learn those skills than hockey. When we interviewed Tim in the video about too much parental interference, he said, “It’s your child and you want to give the best to them but at the same time you’re kind of disrupting the integrity of the game. Your disrupting what it is to make that team and to earn that opportunity.” When I listened to him I was reminded of how many times I wanted to speak to coaches about what I thought was unfair. My intention was always to help my son, not hurt his opportunities. Looking back, I realized that Tim was right. I was disrupting the integrity of the game by trying to overstep the coach’s decision so that I could be satisfied with the outcome. I will always believe that parents have the absolute best intentions for their kids. We manage so many aspects of their life which makes it so difficult to let go of control when they hit the ice. I’ve been asked many times what this lesson means. People often think that I’m referring to the financial cost when I say, “It’s the cost that teaches you the most”. In truth it has nothing to do with the financial cost. The cost I’m referring to are the moments when hockey doesn’t go the way we wanted it to, the moments when your young player didn’t make the team they wanted, they lost in overtime, or let in that horrible goal in that playoff game. Those are the moments that are so hard to watch from a parent’s perspective. Watching your kids struggle in anything can be so difficult but those are the moments that will help to shape your kids as adults. The two stories in the video this week are so different yet they both speak to resilience. The first story is about resilience in sport. As Brock tells the story of this young man who got cut from so many teams you realize his ability to keep pushing forward was what made him successful. As Brock said, “He never gave up, never really didn’t believe in himself, always just stuck with it and in the end, he was better for it.” That quote is advice we could carry with us in anything we are going through and it was learned through hockey. The idea of this lesson is that hockey can teach great lessons in resilience before life does. I think there are no greater stories of resilience in life than those of the Syrian families that endured things so many of us will never fully understand. They came to the rink to learn about hockey but taught us much more than we could have ever taught them. We had the opportunity to interview Michel the coach. He had worked with many of the Syrian families and he said, “Be grateful for what you have, some of these people have walked miles and miles just to find freedom, coming to the rink is an easy task.” The adversity they faced are great examples of resiliency in people who have had so many challenges and tragedy thrown their way yet they’ve never given up. The second story was about the importance of resilience in life. We need to remember that hockey is just a sport. It’s is a fun activity that can teach us so many things. We have no idea what’s ahead for our kids so let’s prepare them in the best way we can. Use hockey to teach your kids a lesson in resilience, don’t stand in the way of adversity teach your child to manage it so they can handle anything life throws their way. Stay tuned for the next video in the series, “Before you yell at your child for their performance on the ice, take a good look at your conduct in the stands." This lesson is something I should have reminded myself of every time I walked into the arena. As I’ve said many times before, our passion can get the best of us and bring out the worst in us. As we prepared for the video series, I had the opportunity to talk to some incredible officials that had numerous stories of conduct they had witnessed while trying to referee a game. As I met with them, what struck me the most, was that many of them told me that becoming a referee was their first part time job. When I remember how nervous my kids were starting their first job, I couldn’t imagine what it would have been like for them if someone was yelling at them while they were trying to gain the experience and knowledge that comes from working. I had to wonder how many young officials went home after their first shift on the ice feeling defeated after being yelled at by parents in the stands. I felt terrible because I knew I had been one of the parents who would have voiced my displeasure with a call or another player on more than one occasion. There is a story in the book where I describe my own conduct that was nothing to be proud of. It was a moment when I caught myself talking about a young player with a group of parents. I realized that all those times when I was hurt because of comments from other parents about my son’s performance had taught me very little. In that moment, I was doing the exact same thing. I’m embarrassed to say that I was no better. As you bring your young player to the rink, please remind yourself that if there were no officials there would be no game. Don’t be the reason a young adult has a bad experience on the ice, whether they are a young player or a referee. Be the reason your young player learns to respect the rules and even if they don’t agree, they can handle their reaction in a way you can be proud of because you taught them how. Remember, before you yell at your child for their performance on the ice, take a good look at your conduct in the stands. One of the things I learned to ask myself when I felt that politics was getting in the way of my son’s hockey experience was, “Am I dealing with politics or do I simply not like the decisions that are being made for my son?” Sometimes when we hear something we don’t like, even if it’s true, we’ll blame it on politics when that may not be the case. 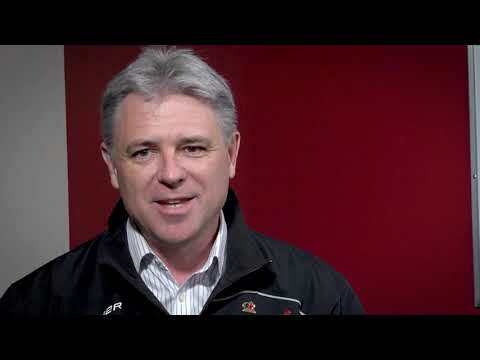 In the last two years I’ve had the opportunity to interview many hockey volunteers. I’ve learned that we all have our own perception of things. I’m sure there isn’t a parent that doesn’t have a story of how a coach or an executive member influenced their child’s hockey experience in a negative way. Often, the perception from parents is that it was all politics. As I’ve talked to executive members or coaches, they’ve enlightened me with their own stories of how they’ve perceived parents to have used their influence in a negative way, so they could push their kids forward in hockey. It is impossible to weed through what is right and what is wrong because we all see things in our way. I believe everyone is doing the best they can. Instead of telling our kids that things aren’t fair, why don’t we teach them to work on their performance on the ice. In the end that’s really the only thing they can control. As I listened to her, I realized we have an opportunity as parents. Knowing how much we influence our child’s experience, we should work hard to use that influence in a positive way. Our young players are going to deal with politics for the rest of their life. It will happen in their careers, families, and in many more aspects of their life. Hockey is a great way to prepare them for how to deal with politics. It always comes back to what can we control. It’s hard to believe that it is almost the end of November and we are nearly at the halfway mark of the season. I hope the hockey season is going well and you’re enjoying the gift of being a hockey parent. As I’ve said many times before, there is nothing quite like it. I’ve also said many times before, it was something I wasn’t good at and I needed all the help I could get. One of the best pieces of advice from my husband during the hockey parent experience was when he said, “You and I aren’t able to be objective about Brock’s abilities on the ice because we love him unconditionally.” As much as it made me angry at the time, I knew he was right. We decided when he started to play at a more competitive level to find someone who we trusted, someone that knew hockey, and someone who would tell us the truth to provide us feedback on his abilities. There were many times that I thought he should have made a team or been the starting goalie. I’d ask his goalie coaches opinion and without hesitation he’d tell us what he thought. Although there were many times I didn’t like his answer, I realized that if I trusted him when he told us Brock was doing well I needed to trust him when he said he wasn’t……not an easy pill to swallow. 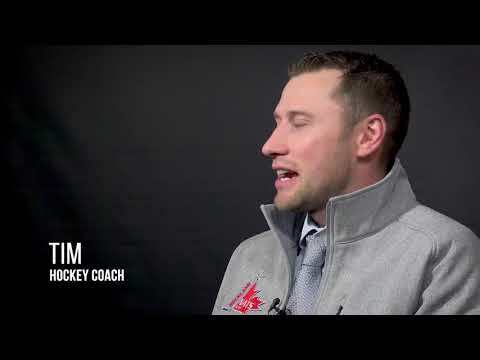 During one of the interviews for the video series, Tim said, “I have a lot of people that are very good, but I do have some that still feel that their 16-year-old, that’s playing house league B hockey is going to be in the NHL.” I couldn’t help but wonder what that experience is like for those 16-year-old players who want to play because they enjoy it and know that this is as far as they are going to go, yet Mom or Dad are still pushing them to be the star player. Tim’s story is a prime example of a parent seeing hockey through a different set of eyes. If you’re working hard to convince the coach how good your young player so they’ll get more ice time, it’s time to take a step back and take the advice of someone who will tell you the truth. If they are good enough the right people will notice without you having to convince anyone. It’s a tough lesson, but, Parent’s see hockey through a different set of eyes! People have asked me to explain what it means to raise a good person who likes to play hockey, not just a good hockey player. I can honestly say there is no better example of what this lesson is about than the Capital City Condors. The Capital City Condors is a group of hockey teams that is made up of young players with special needs who otherwise wouldn’t have the opportunity to play hockey. During the interviews that day I realized the impact that Jim and all involved have made on these kids and their families. The time commitment that Jim and his wife Shana, Lloyd, the Turris’ and so many other volunteers have made is beyond what I think they even realize. As I said at the start of this article, they are all a great example of individuals who have used the game of hockey and their influence in the sport to help so many people. They are all good hockey players but more importantly they are incredible human beings. I want to end this week’s article with a story about Jim talking to one of the young Condor players and his mother’s thoughts on their conversation. She said, “Six months ago he was socially cut off from everybody. He couldn’t even talk to one member of his family but six months of being part of a team and you, a stranger, had a completely comfortable conversation with him. Our whole family’s life has changed!” That’s the impact of using hockey and a community to do something incredible. Watch for our special Happy Holidays message next week! Our next video, “Leave your baggage at home” will come out on Thursday, December 28th. Being a Hockey Mom that doesn’t have an athletic bone in my body made me even more dangerous when it came to having perspective around the game. Every time I would watch my son do something good on the ice, I would be beaming with pride because he was doing something I knew I never could. With each exciting moment also came another moment of anxiety. I felt great pride when he was doing well, and I felt completely stressed if he wasn’t. If I could have only come to terms with the fact that it wasn’t my stress and that this was his experience not mine. Brock fully admits that his earphones before games were less about the music and much more about drowning me out. I remember him always putting his earphones on as soon as he got in the car and he would tell us that the music helped him to focus. He has since told us that it was also a coping mechanism, so he didn’t have to listen to us asking him if he was focused, if he knew how important the game was, and if he was ready for all the shots he was going to face. I’m so thankful that he found a way to drown us out. When I think about it now I feel so bad about some of those car rides. I truly was very excited for him and loved to watch him play, unfortunately I was also very worked up about the experience and it obviously showed. I think this is a lesson that applies to every aspect or our children’s lives. We’ll watch them face so much more than stress in hockey as they grow, and we need to learn not to put our stress on each life lesson they face. When they look to us for guidance we don’t want to put them in a position that they’re calming us down or worse walking away from us with their earphones on. Have faith that you’ve raised good human beings that can handle what life will put in front of them. I think Hockey Mom Heather summed it up best when she said, “I think we have to recognize that it’s our kids sport, it’s not my sport. It’s just like realizing when your child is born, and you have goals for that child as a parent, but those goals aren’t yours. Eventually it changes, and you have to look at what your child wants.” Leave your baggage at home! I have said so many times that if your young player is good enough, the right people will find them and move them forward. There are scouts that are trained to pick out the kind of talent that will offer a child a career in hockey. So, when you feel your child isn’t given a fair shot, tell them to work hard, use every second on the ice to be at their best. If they’re meant to move up, the right people will recognize their talent and move them forward. It’s not our job as parents to do that for them. I can say without hesitation this is my favourite lesson. I think it is also the most important one. I have had so much time to reflect on what hockey has meant to our family, to my son, and to me as a Hockey Mom. I’ve often said to parents, “If you think this experience is mainly about hockey, you are so wrong.” I didn’t get that during the experience, I really didn’t get it until my son stopped playing. It was only then that I realized that every lesson I’d learned through hockey also applied to so much of my life as I moved forward. While I was conducting interviews for this lesson, I had the pleasure of meeting Christine and her young son. She walked in with her wide eyed young goalie and he was adorable. He was polite, and he greeted me with a smile and a handshake. He was wearing a GONGSHOW hat, so I had to peek under the rim to be able to see his little face. He looked around the room staring at the cameras and the lights; you could see he was in awe of the whole thing. My friend doing the filming broke the ice by saying, “Do you have any other interviews today?” The young boy looked up, not realizing he was joking and said, “No, just this one.” His Mom smiled at him as she watched him take his seat. We decided we’d interview them together, sitting side by side. As soon as we told them they could sit together the relief on their faces soon became very clear. When they took their seats the young boy instantly started to fidget, legs swinging, and hands tapping on the chair. Mom gently leaned over and put her hand on his, with that little touch he seemed to instantly calm down. I started to ask him what he loved about hockey. He described the way it feels to be in an exciting game, he talked about his coach, and the great friends he’s met. With every answer Mom’s smile seemed to get wider and wider until finally it was her turn. I asked her, “What do you love the most about watching your son play?” She stopped looking at me and she turned to him and said, “Everything! It’s not one specific thing, it’s every time I get to watch him, every time I get to drive him to the games, and every time we go for hot chocolate after, I guess I love it all.” It struck me that none of that had anything to do with wins or losses, it had everything to do with watching her son thrive and more importantly it had everything to do with being with him. I turned to him and said, “What’s the best part of having Mom in the stands watching you?” He said, “I like looking up at her and when I “do good” she has a big smile on her face.” My heart instantly melted, and I knew this was a moment I wanted to capture. We asked them if they could get a little closer, so we could take a picture. Without any instructions or inhibitions, this bright eyed seven-year-old boy crawled up on Mom’s lap and put his arm around her. There they sat cheek to cheek with big smiles on their faces ready for their picture. It’s an image I don’t think I’ll ever forget. I don’t think Christine had any idea that I was close to tears watching them. They reminded me so much of Brock and I from years before. She reminded me of what I loved about the game and she reminded me of what I missed about those moments. I am so blessed to have had the experience and even more blessed to see my son move into adulthood. Life waits for no one and I will continue to enjoy the ride as we move into the next phases and experiences of our lives. But I will say there is nothing quite like the hockey years, so enjoy them, don’t let stress get in the way of the fun. This will not last forever. Hockey can be your greatest teacher and provide you with some of your most incredible memories.